One of my favorite wedding moments, as a musician playing in our band Cracked Ice, is when what I call the “shiver factor” happens: it’s that indelible instant when the romance in the air, the bonhomie of family and friends, and—most especially—the music is just so right that . . . I feel an unmistakable, tingly shudder, like a small frisson of pleasurable lightning. And most of the time, that moment occurs during the First Dance. “It Had To Be You”, by Harry Connick, Jr. Okay, no doubt these are all great songs in their genres, with iconic singers performing them, and yet . . . allow me to pose a question here: can you honestly say that one of these songs has played a meaningful part in the drama of your life? If so, then I say, have at the Anne Murray chestnut (originally recorded in 1980 for the “Urban Cowboy” soundtrack) with full gusto, knowing that the familiar lilting waltz cadence embodies a special resonance for yourselves as a couple. Which is my point here: the best First Dance is the one that means everything to you—and that song could be absolutely anything. For instance, at a wedding Cracked Ice played on a beautiful New England island last summer, the couple requested “You’re All I Need to Get By”, the Marvin Gaye/Tammi Terrell Motown duet. This was our first time performing the song, and while it’s a personal favorite of mine, I wasn’t sure if the intense dynamics and cresting melody might not overwhelm, and perhaps take the focus off the couple a bit too much. Comes the moment, and as our singers Susan and Bobby lovingly caressed the first verse vocals, this couple held each other gently, swaying delicately on the dance floor, gazing intensely into each others’ eyes. As the song’s pre-chorus built up to the triumphal chorus back beat, they started to move more rhythmically, ultimately morphing into an ultra-cool, old-school Soul Train-style boogalu . . . and then, the groom signaled us to start the song over again from the top, so that their families and friends in the room could join them on the floor, from the beginning, which we did as a smooth segue. The result was that everybody in the house felt that same cycle of rising emotion that the song embraces., and for me . . . the Shiver Factor. Another unusual First Dance moment from the Cracked Ice canon: . . . a little while back, we played a wedding in a stylish, cavernous Tribeca loft, and for their First Dance, the couple specified that we perform a quaint old Conway Twitty/Loretta Lynn ditty titled, “You’re The Reason Our Kids Are Ugly”. Once again, our guitarist twanged the song’s down-home intro perfectly, and our singers dug into the chorus refrain “you’re the reason our kids are ugly, darlin’, but looks ain’t everything”. And it turned out that the couple and their friends all loved classic country music, and by the last chorus, everybody was singing along. Which made for a very different, but ultimately triumphant “shiver moment”. At another storied Cracked Ice wedding, this one at the wondrously atmospheric Angel Orensanz Center on NYC’s Lower East Side, we were asked to play the couple onto the dance floor with—are you ready?—“A Love Bizarre”, by Sheila E., as they danced out into the room, prancing like Prince & The Revolution on the Tonight Show. Then we stopped the song on a dime, and slid directly into “Cruisin’”, by Smokey Robinson, as the couple tried out their smoothest ballroom foxtrot moves. The moment came off just as they’d conceived it, and by golly the crowd was cheering like a full-house at Radio City Music Hall . . . which was just what that couple were going for, and what meant the most to them. I’ll close my treatise here with a recent anecdote that’s a real heart warmer. Cracked Ice played a wedding last year where I knew there had been some tension between the two families of the couple getting married, who requested we perform current singing sensation Adele’s version of “Make You Feel My Love”, which was written by Bob Dylan. It’s a very delicate yet simple song, where the lyrics, as with Dylan’s best work, are fully loaded with passionate emotion; its theme is that one person’s love for another can transcend hard times, stormy weather, even time itself. The band stuck with the stark musical backing from Adele’s recorded version, led by our pianist, and Susan invested the melody with a quiet grace and depth that vibrated throughout that large tent, pitched hard by the pounding Atlantic ocean. As she held that last note—“my love”—there wasn’t a dry eye amongst the crowd surrounding the dance floor. And from then on during the reception, I do believe I observed the two families warming to each other, as that memorable evening and party progressed. 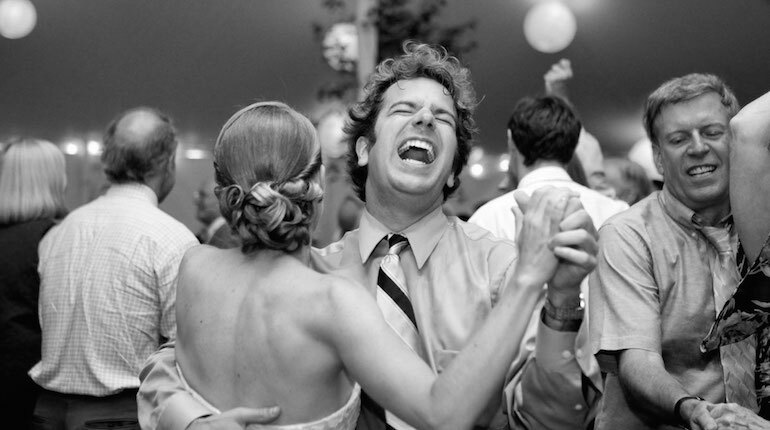 My point is this: I encourage a couple to indulge themselves and cast a wide net when making the choice for a First Dance, because it’s always a chance to create a moment that will live forever in the hearts and minds of the couple, their families, and everybody lucky enough to be present. Great songs and musicians can rise to the occasion and make this happen, if we let them.